Unfortunately, during the menopausal transition, many women experience a drop in emotional health. Tasks throughout the day become increasingly difficult, interactions with others become more stressful, and you are noticeably less sociable. Such shifts can be warning signs of depression or anxiety. Luckily, there are many ways you can manage your depression and anxiety symptoms. Learn more about the different methods you can employ to avoid depression and anxiety during menopause. Many people underestimate the power of this activity. They may shy away from trying meditation, since they do not think they can find the mental clarity necessary to be successful in it. However, the idea that perfection is necessary to be successful is false. The only requirement for meditation is your willingness to participate. As you begin this practice, do not expect instant tranquility, as thoughts will habitually circulate. Just observe your worry patterns and release them through your exhales. Doing this can help you reduce anxiety and enhance your mindset. Continue 15 - 20 minutes a day, without judging your experience, and enjoy the results. A sedentary lifestyle can intensify feelings of tension, despair, and lethargy. When you go from sitting at work, to sitting in a car, to sitting for dinner, to lying in bed all day for the majority of your week, it can negatively impact your physical and emotional health. Make sure to fit in 3 hours of exercise every single week. You can do cardio activities, such as swimming, brisk walking, or jogging, or you could do relaxing activities, such as yoga or Pilates. These activities will increase the production of serotonin and endorphins, which will improve your overall well-being. Since hormonal fluctuations play a significant role in increased depression and anxiety during menopause, try taking phytoestrogenic herbs to restore estrogen levels in the body. Black cohosh and dong quai are great choices for this, whether in tea or supplemental form. For targeting anxiety, drink a cup of kava or valerian. Valerian is especially effective if you have stress-related sleep disruption. For treating depression, St John's wort may help. Studies have found this herb to greatly improve mood for many patients. If you feel compelled to hide in your room and shut out the world until your feelings fade, this is not a wise choice. Being in familiar spaces alone will often only accentuate your worries. Try going out with your friends or family, even when you don't feel like it. Spending time with loved ones can provide you with much-needed emotional support. This is because socialization releases oxytocin, which induces feelings of love and friendship. Don't let anxiety and depression negatively impact your life. People do not realize how emotionally debilitating it can be, but with these positive shifts and some support, you can greatly benefit. 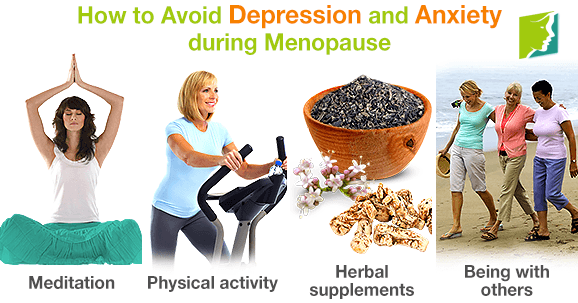 For further information on how to control depression during menopause, click here. Learn all you need to know about postmenopausal depression, from its causes to symptoms and treatment options, to tackle the condition better.